Inside St. Louis features some of our favorite St. Louis area restaurants which are rich in history and feature some fabulous antiques and memorabilia. They may be well-known or the best kept secret in town. 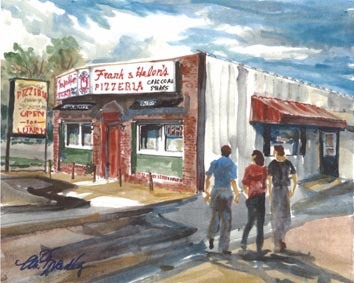 Most of the restaurants are family owned and operated and have been around for several generations. The reviews and historical word sketches are researched and written by Ron (Johnny Rabbitt) Elz of KMOX. His Saturday night '50s & '60s oldies show Route 66 is one of the hottest radio programs in the Midwest...and it's where you can always get updates on the latest activities of the Antique Warehouse! 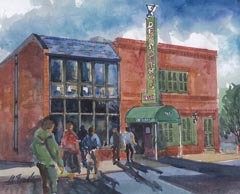 Each review showcases an original water color painting by local artist Marilynne Bradley. 5x7 prints are available for purchase for only $29.95 including first class mail. Click here to order. 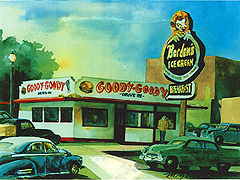 Restaurant reviews are graded on atmosphere/history, quality of service and, of course, the food. Antique Warehouse grading awards each review an A, B or C.
If you know of a historically significant restaurant that you’d like to nominate for review, click here. Please include the restaurant name, address, and what makes the restaurant unique.